This pdf clocks in at 2 pages and is a mini-dungeon. This means we get 2 pages content, including a solid map and all item/monster-stats hyperlinked and thus, absent from the pdf, with only deviations from the statblocks being noted for the GM. Oh, and the series now comes in an archive that also contains…*drumroll* a .jpg-version of the map! Yeah, that’s pretty cool. Better yet: GM-friendly version of the jpg’s included as well! Okay, so what happens when an intellect devourer happens upon a bunch of kobolds currently fighting a drow antipaladin? Well, in this case, the intellect devourer managed to kill the drow and has since then whipped the kobolds into shape and recruited a cadre of diverse creatures under its banner. And indeed, as a disparate cadre of entities is concerned, they are pretty nice, aiming to subdue any but drow. Drow must die. Now, in a pretty cool twist, we get a table to randomly determine who is where, with percentile values. This is per se rather cool and indeed, the respective rooms sport tactics for the creatures that are most likely to be here. This renders the complex rather dynamic, but brings me to the crucial issue here: You see, the dungeon has two levels, and one of them is 1 square left, two down of where it’s depicted on the map. There also are pipes and everything and the strategy of the adversaries is per se nice…but over the neat enemy set-up, the module forgot depicting the dungeon. The map doesn’t help there either, making the whole complex feel opaque and sterile. Editing and formatting are good, I noticed a missing hyperlink and a few minor wording/formatting issues, like the use of a rules-term where none is intended. Layout adheres to a beautiful 2-column full-color standard and the pdf comes sans bookmarks, but needs none at this length. Cartography is this time around less impressive than usual for the series and pretty bare-bones. The .jpg version included here, which you can easily cut up and hand out to the players as they progress is a huge bonus -and even better: A KEY-LESS VERSION sans the annoying letters/numbers is included as well for full VTT-compatibility!!!. The pdf does sport one nice piece of original full-color art – kudos! Stephen Yeardley usually does much, much better. The two-level set-up is interesting, but suffers from the limitations of both wordcount and map-detail and the dungeon itself falls somewhat short of what it could easily have been. Try as I might, I can’t really recommend this one, in spite of its really cool premise – it feels like half a module. 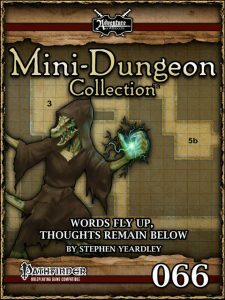 I strongly suggest you check out the other mini–dungeons penned by Stephen Yeardley, though – they tend to be amazing. For this one, though, my final verdict can’t exceed 2.5 stars, rounded down.